Image: Indonesian Parrot Project [larger view]. The cracids — chachalacas, guans, and curassows — are a large family of spectacular gallinaceous birds found in tropical America; large and meaty, they are often under intense hunting pressure, and as denizens of extensive forest, this family accounts for far too many badly endangered species. The various Penelope guans — medium-large, with blackish plumage coarsely streaked white, red gular sacs, bluish facial skin, and a more or less conspicuous crest — are widespread in Central and South America; the most familiar is Crested Guan, probably the most common of the surviving larger cracids. Identification of Penelope guans is difficult, and the most important clue is often range. Knowing only that this bird was photographed in “South America,” I would not presume to identify it beyond the genus level, but I am sure there are those out there who know this group well enough to distinguish the species without recourse to range. This entry was posted in Birding, Mystery Birds and tagged bird ID quiz, bird watching, birds, Crested Guan, image, mystery bird, ornithology, Penelope purpurascens, photo, photography, picture. Bookmark the permalink. I’m going to guess that that’s a Crested Guan (though it doesn’t seem to have much of a crest). That’s based on a few minutes’ googling for images. I’m getting the strong feeling that your comments are somehow being “spammed”–a feeling only reinforced by that last contributor’s name. A note: in one of the field guides (no time to rummage around and figure out which), the first comment offered on Crested Guan is that it is “no more crested than other guans.” How’s that for helpful? Rick – that seems to have been going on for some time. It be a few hours before Grrl gets to see this – she doesn’t have a good connection at the moment. 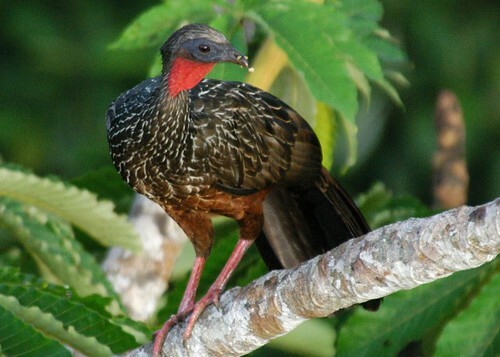 I do wonder though – do crested guan produce crested guano? unfortunately, i was being spammed. i think i’ve fixed this. Somehow my turkey guess disappeared? Well it was wrong anyways.